This is Capital Cafe 華星冰室, one of the top rated cha chaan tengs in Hong Kong right after the Australia Dairy Company. They are known for their scrambled eggs on toast, condensed milk bun and milk tea. We went on a Sunday morning, and yes, you can see the queue outside the place. This cha chaan teng is famous and they serve some incredible food. Also, we found the service there actually pretty good by Hong Kong standards. Do be sure to look at our previous feature on the Australia Dairy Company, where I talk a bit more about my love for scrambled eggs. They serve top class scrambled eggs here at a very affordable price, and they have a secret gem in their condensed milk bun. Yes this is an English menu in Hong Kong! Some of the more popular establishments do provide an English menu upon request. Australia Dairy Company has an English menu a well, but expect to get scolded if you ask for it there, especially if you are Chinese. On the contrary the service that we experienced here at Capital Cafe was much better. The staff there even managed some smiles. The locals will get their breakfast set. As usual it presents a ridiculous value at HK$34 for macaroni with ham, eggs, toast and milk tea. You need to remember to specify a change to scrambled eggs, just like at Australia Dairy Company. If you’d rather not have macaroni, you could get their ‘light meal’ set instead, where they give you two pieces of ham. We had done our homework and we knew that their breakfast set had a smaller portion of scrambled eggs than if you ordered à la carte. So we ordered their scrambled eggs on toast à la carte, two of their famous condensed milk buns and milk tea. The scrambled eggs on toast à la carte is a pricier HK$20, with the condensed milk bun at HK$14. Their milk tea is priced at HK$19-$21 with the pricier cold version. For those that are wondering, their condensed milk bun is actually reflect in their English menu as ‘Toasted French Bun’. Their Chinese menu has it as 奶油豬仔包 (nǎi yóu zhū zǐ bāo). 奶油 is condensed milk, 豬仔包 is a French-style bread, similar to a small baguette, prevalent in Hong Kong and Macau. If you have a fat wallet you could try their famous scrambled eggs with black truffle as well for HK$42. From what I’ve seen you just get some black truffle on top of the usual scrambled eggs on toast à la carte. There was a ridiculous amount of scrambled eggs on top of that piece of toast. I think there was actually more eggs than how it appears on the picture. If you order the set you get maybe around half the amount of eggs. Putting a forkful of scrambled eggs on my mouth, I can say that they are delicious. Capital Cafe’s scrambled eggs are better than any you would find in the whole of Singapore. The scrambled eggs are soft and tasty with the right amount of moistness and a fantastic taste. They don’t beat the ones at Australia Dairy Company though. I rate the scrambled eggs here at Capital Cafe 4.4/5. I am a scrambled eggs purist with a limited calorie count so I did not try their black truffle version. Looking around I didn’t see anyone else order it as well, but if you’re up for it and don’t mind the price it may be worth a taste. Or you could call it ‘Toasted French Bun’ according to their English menu. This item is insane! It is super delicious and super sinfully fattening. The bun is toasted to the perfect crispiness and with the sweet condensed milk it sent chills up my spine. You have to try this, even if you don’t see too many people ordering it. We rate this 4.5/5. Unfortunately on my second visit here on the last day of my trip, the bun did not have the same crispiness as my first visit, or I would have given it an even higher rating. Yes, they just missed out on getting ‘The Ultimate Taste’ recognition for this item. Given this inconsistency I have to add the YMMV caveat. By now if you’ve seen a few of our Hong Kong reviews you will notice that we usually have a photo of the iced and hot version of the milk tea. I prefer the iced version, and Sheryn prefers the hot version. We get to rate it from the perspective of both their hot and cold versions! The milk tea here is really great. It is super thick and milky, with the usual balance bias towards a stronger tea taste. We rate this a 4.2/5, it is the second best milk tea that we tasted in Hong Kong after the one at Lan Fong Yuen. If you are staying on Hong Kong Island (as opposed to Kowloon), you have to come here for breakfast some time. If you happen to pass by the Wan Chai area you should strongly consider coming here for food as well. They have fantastic scrambled eggs, condensed milk buns and milk tea. I fell in love with Hong Kong’s cha chaan tengs and Capital Cafe is one of the reasons. 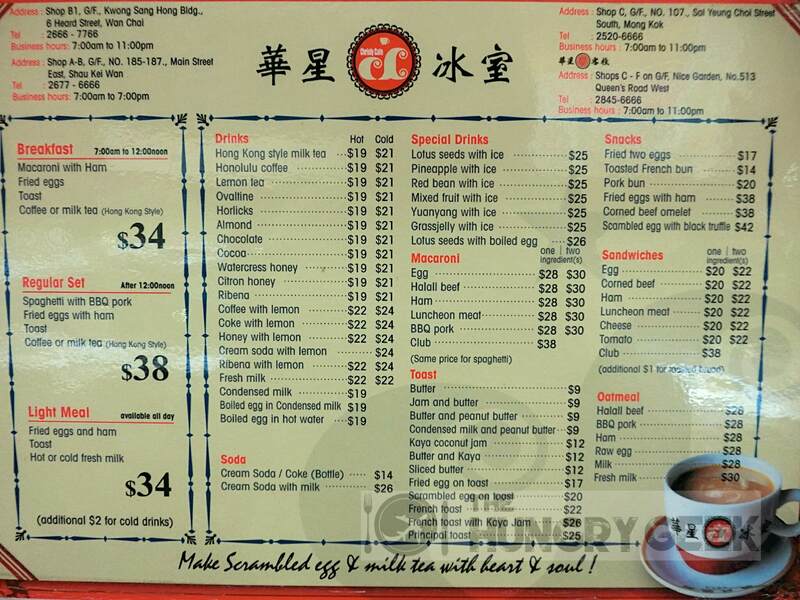 Australia Dairy Company 澳洲牛奶公司 – Scrambled Eggs In "Hong Kong Cha Chaan Teng"